Bernard Cohn was born in Prussian-occupied Poland in 1836. He left home at the age of 16, arriving in New York in 1852. 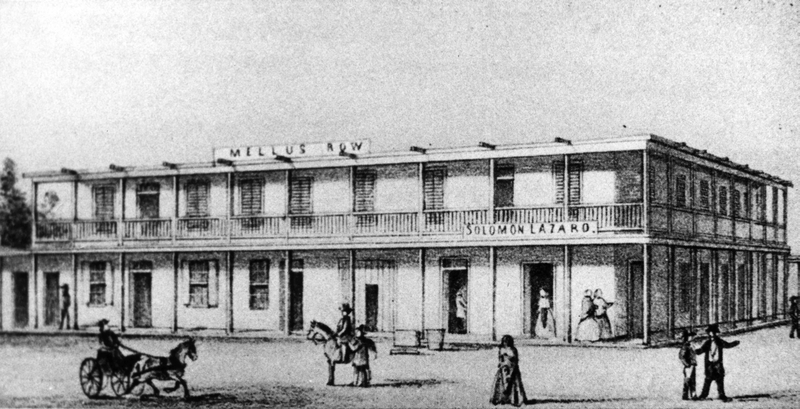 In 1855, Bernard Cohn arrived in Los Angeles and worked as a clerk in the store of Isaac Schlesinger, located in Bell’s Row. Two years later, he opened his own dry goods store at the corner of Los Angeles and Commercial Streets. The store was unsuccessful, so he established a brokerage business just south of the Plaza. Gold discoveries in the Arizona Territory in 1862 prompted Cohn to set up a general merchandise business there. 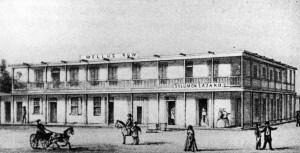 The Goldwaters perviously had retail businesses in both the Gold Country and Los Angeles. However, they had gone bankrupt because of their Gold Country debts. While in La Paz, one of Cohn’s customers who owned a gold mine asked Cohn to watch the mine while he went to New York for a loan in order to pay off his bills. While managing the mine, Cohn uncovered a section that produced $110,000 worth of gold. Form that, he took the debt the customer owed to him and turned the balance over to him when he returned. In 1867, the Goldwaters bought out Bernard Cohn. Cohn returned to Los Angeles, where he went into the food business with John Jones. In 1871, he joined the growing wholesale grocery firm of Hellman, Haas & Co.
Bernard Cohn retired in 1878, and was listed as a “Capitalist” in the City Directory. Bernard Cohn was elected to the Los Angeles City Council in 1876. He was elected Chairman of the City Council, and when the current mayor died, he was unanimously elected Mayor pro tem. He later ran for mayor, but lost. However he was re-elected to the City Council and was again appointed its chairman. He ran for mayor a second time, but lost again. Bernard Cohn was an active member of Congregation B’nai B’rith, serving as President in the 1870’s. 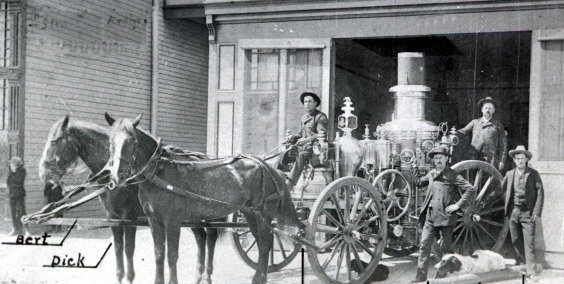 He was also a member of the Volunteer Fire Department – Confidence Engine Company No. 2. Bernard Cohn served as President of B’nai B’rith Lodge No. 341 and President of the Hebrew Benevolent Society. In 1870, he was the founding Vice-President of the Gan Eden Lodge #8 of the Kesher Shel Barzel Order. He was also a member of the Odd Fellows. Bernard Cohn married Esther Norton, a sister of Samuel and Moses Norton, in 1861. Three children were born to them: Julius, Caesar, and Carrie. Esther Cohn passed away in 1885. Bernard Cohn died in 1889, while paying a condolence call. When Carrie Cohn married Simon Cahen of Azusa, the Catholic prelate of Los Angeles, Bishop Francis Mora, who was a friend of Bernard Cohn, wrote of the recent wedding officiated by Rabbi Abraham Edelman, as reported in The Morning Journal of January 20, 1880. On this day of so much joy for you and your family, allow us to join our humble congratulations and sincere wishes to those of your many friends on the occasion of the marriage of your dear child and good young man whom providence has destined for her. May the God of Abraham, of Isaac and Jacob bless their union and be with them. May she be amiable to her husband as Rachel, wise as Rebecca, long lived and fruitful as Sarah. May both, to your joy, see their children’s children unto the third and fourth generation, filled with all the blessings which we invoke upon them, as well as upon you. Respectfully, Francis Mora, Bishop and Clergy of the Cathedral. But, there was more . . .
From 1872 until his wife’s death in 1885, Bernard Cohn had maintained two domestic establishments and reared two families, one Jewish and one Catholic. He married Delfina after the death of Esther in a “Mixed-Marriage” contract. After Bernard Cohn’s death, a court case that lasted over 18 months decreed that the Delfina had received a Marriage Contract, but since there was no assumption of Marriage Rights and Obligations after the writing of the contract, there was no “Marriage.” Therefore, Delfina did not share in the estate. However, the three children of Cohn and Delfina were ruled legal in terms of Rights of Inheritance. Norton B. Stern, “Bernard Cohn: Miner, Merchant, Civic Leader, 1835-1889,” Western States Jewish History 38/3. William M. Kramer, “Historic Letter from the Bishop, 1880,” Western States Jewish History 42/2&3. William M. Kramer, “Some Jewish Civil Servants of Early Los Angeles,” Western States Jewish History 42/2&3. Max Vorspan and Lloyd P. Gartner, History of the Jews of Los Angeles (San Marino, CA: Huntington Library, 1970).